I’m not the only one who views J. Drew Lanham as a superhero of advocacy for the natural world—especially for greater participation among people of color as well as increased revelry for birds! Lawrence Public Library is partnering with community organizations for Dr. Lanham’s visit—including the Langston Hughes Center of KU as part of our ongoing series, Diverse Dialogues on Race and Culture. Join us to welcome Dr. Lanham to Kansas! 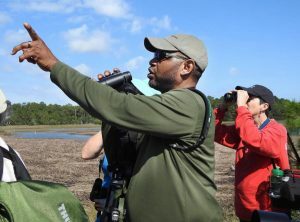 He'll talk on May 24 at Liberty Hall and lead a Birding Tour May 25 at the Baker Wetlands. The questions below demonstrate our excitement to learn more from the author of the award-winning book, The Home Place: Memoirs of A Colored Man’s Love Affair with Nature. Read on to find out about his passion for nature, birding, conservation ethics, and the extra caution necessary for a black man to explore the rural American wilderness. The following is my respectful effort to transcribe a telephone interview I had with Dr. Lanham. SB: What are you hoping to see, bird-wise or nature-wise during your first time visiting Kansas? JDL: Kansas is at the center of everything which means it’s at the cross-roads for bird fly-ways and by-ways. I’m looking for that essence that defines the place, to see the birds singing the praises of the heart of the country—birds like bobolinks, dicksissels and scissor-tail fly catchers that roll on those waves of the sea of grass. I hope to see a representation ecologically of the place that defines the beginning of The West where prairie used to dominate. I’m fascinated by the Konza Prairie and I hope to catch a glimpse of bison there. And to get a feel for the native cultures that once existed there. To understand the culture of how people connect and appreciate nature and take the ecological temperature or depth sounding of the place. I want to begin to get a sense of the conservation challenges and how things are changing there so that maybe what I do as a Southerner can ultimately have some impact on what happens in the Midwest because we share some of the same birds and passions for them. I’m looking forward to all of that! It’s a short stay for me that hopefully will later turn into longer stays. Birding with J. Drew Lanham. Credit: Audubon.org. SB: I would love to hear who your favorite writers about birds, larger nature topics or about connections to place and intersections of ecological & social justice are. Also, what do you read for relaxation? JDL: As a writer I am who I read. I always start with Aldo Leopold. I adopted him as a posthumous grandfather. His writings are central to who I am as a writer and as a conservationist. His writing expresses the heart of conservation and why caring for nature is our moral imperative. And especially in the Midwest, I like to recommend George Washington Carver—any works by or about the Black American conservationist are critical. He was pivotal in helping to save the soil of much of our landscape and helping farmers and agriculturalists to understand the importance of tilling on the contour and planting nitrogen-fixing cover crops. That’s as deep a conservation story as we can have. Rachel Carson informed a new movement beyond conservation into environmentalism with Silent Spring, but her lyrical writing in Under the Sea Wind is important. It’s about her love of the sea. When you can read about something people loved that gives you fuel and motivation to love and express that love. Note: Dr. Lanham shared more great reading recommendations; check them out here. SB: Transitioning to that very powerful chapter, "Birding While Black” in The Home Place—how do you “stave off confrontation” when you’re hunting-while-black? Every day in America we hear of another unarmed black man shot, often fatally, in confrontation with police. How does this context shape your thoughts on "hunting while black”? JDL: I’m still very wary when I’m out hunting. I have to be aware that I am both predator and prey. I’m always a part of some food chain of consumption—even when that consumption is hate, because I think hate is simply another fang in the predator’s jaw. Although I am armed, I’m not mentally equipped to defend myself or kill another human being—that is unfathomable to me. If I have to defend myself, my first instinctual response is not to confront; it is to move away to hunt somewhere else. There’s never going to be a winner in that sort of a confrontation. SB: You are a leader working with high-profile organizations to champion conservation and support greater diversity inclusion in environmental work. Your active board member participation is impressive, including: National Audubon Society, Audubon South Carolina, the Aldo Leopold Foundation, BirdNote, and the American Birding Association, and you are a member of the advisory board for the North American Association of Environmental Education, and a fellow of Toyota TogetherGreen. Have you seen indications that you have made an impact—working toward greater participation and inclusion of people of color in environmental sciences? JDL: I have seen it! I’m grateful to be out in the field speaking to large audiences and doing the mission of these organizations. I have seen deep intentional thinking in these organizations—sometimes painful thoughts and beyond that to acts and doing... Everything from climate change to conservation needs to be colored more deeply. I hope these organizations would have been trending that way, but it’s great to be a part of helping move the work along, to make the impact. It’s better to be inclusive than not. Like my grandmother, Mamatha, used to say: “many hands make lighter work,” and I like to say more eyes make more birds. The more people you get to connect the better. Leopold talked about keeping all the cogs and wheels and I think this includes components of inclusion and diversity. 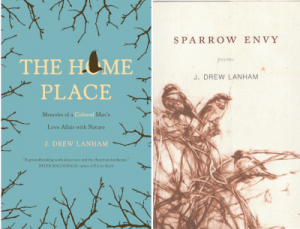 Read more from authors of color who write about connections to place and intersections of ecological & social justice in this reading list. -Shirley Braunlich is a Reader Services Assistant at Lawrence Public Library. Cover image credit: Leah Sewell.